He is a wandering swordsman from the land of Mirrah who was tricked and is found locked in a jail cell. Upon freeing him he will tell you who he is and what his goals for revenge are. He moves around the country in search of the man who backstabbed him. Gives you the gesture "Fist pump"
Located in Huntsman's Copse, Shaded Woods and Brightstone Cove Tseldora. Will only appear in Brightstone Cove Tseldora once both his and Mild Mannered Pate's dialogue has been exhausted in every location. Details below. Though he claims to be from Mirrah, his armor description implies that it isn't even actually from Mirrah, but a replica, and his helm covers his face. Cale the Cartographer claims that he saw a man that looked similar to a serial killer in Mirrah, and that his name was "Cray something". Cale is first discovered in the same area that Mild Mannered Pate is, whose equipment indicates that he might not be what he seems. Creighton's mask covers his face, so recognizing his face would be a difficult task, but his armor, weapon and physique might be easier to. Creighton and Cale do not have the same accent; Pate and Cale do. Creighton tells you that he thinks Pate kills people because he enjoys it. Pate's spear's description states that he has been involved in countless battles, and also that he has something to hide. His armour's description states that it was pillaged. Cale however says he saw a man who looked like a serial killer only after Creighton has been released. Cale's explanation might be for in-game clarity, as to make sure the player has already met Creighton before being warned about a murderer. During his confrontation with Pate he shows complete, nearly psychotic determination to slay the man, while Pate tries to talk his way out of it. Pate has been described as a "smooth talker" and could be trying to play the innocent victim to get the player to help them during the fight. 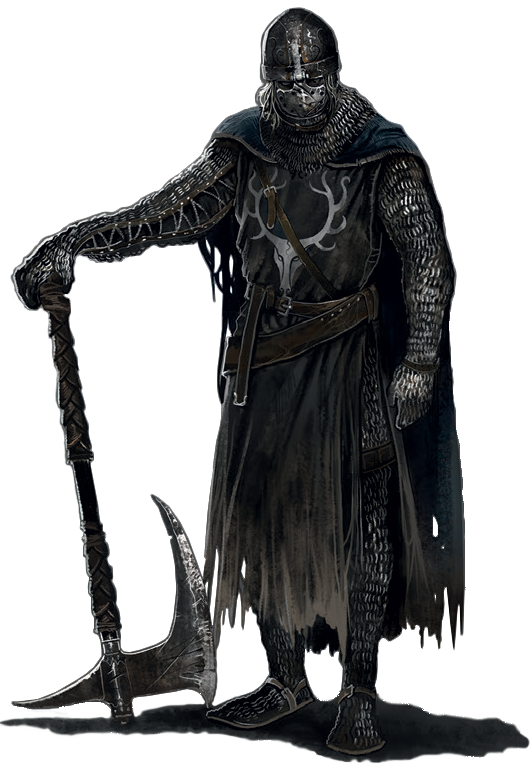 If he was a killer, the imitation knight's armor would be a good way to avoid suspicion among passer-by. In Creighton's dialogue he states that Pate wears a unique ring. During your first encounter with Pate though, he lies about the ring, claiming a man who was trapped left it behind. This may show that Pate does not want to be identified. Both encounters with Creighton are only comprised of him warning you of Pate and what he plans to do with him. However both encounters with Pate involve him directing you to a very dangerous/trapped area and is then surprised when you survive. While Pate does warn the player about traps ahead, he doesn't explain the full danger therein. (He only warns the player about the door closing behind them in the Forest of Fallen Giants, and not the small army of hollows inside.) Possibly to make the player underestimate the danger ahead, causing them to rush to their death. It is worth noting that Creighton does not do anything to harm the player, whereas Pate sends the player into two different ambushes for "Treasure" (although Pate does explicitly warn the player what will happen if they proceed). Both of them booby trap the chest in the Brightstone cove, though. If you have killed Pate earlier you can still get the ring by talking to Creighton in Brightstone Cove Tseldora at the cost of giving him Pate's ring. In Scholar of the First Sin, the location of the second encounter has changed. you can now find him in the shaded woods ruins, in the right tower near the path to the boss. In the original Dark souls 2 trailer it shows three Mirrah Knights identical to Creighton fight and lose to the Faraam knight. Makes an appearance in Dark Souls 3 as an invader and as a part of a sidequest to help another NPC defeat him. Found next to the Undead Lockaway bonfire, accessed with the Undead Lockaway Key. it is also worth noting that once you've freed Creighton, and after you've rested at the bonfire, Creighton can be summoned for the Skeleton Lords boss fight. his summon sign is located inside the cave that leads to the waterfall/boss fight. Near the Ruined Fork Road bonfire, sitting by the exit nearest the fog. In Scholar of the First Sin, you can now find him in the Shaded Ruins, in a tower near the path to the boss fight with Scorpioness Najka. Will only appear if you have exhausted both his and Mild Mannered Pate's dialogue. Head down the stairs from the Chapel Threshold bonfire and slide down the rope. Go inside the door to your left to find him. You can choose to help either side in the fight, whoever you help will thank you and Creighton will give you his armour set, weapon and shield and a key to a locked room. While Pate only gives you his ring and key. If you allow Pate and Creighton to fight to the death without intervening, and Creighton wins, he will not give you the Tseldora Den Key. This is even if you did NOT summon Pate for the Last Giant. Whether Pate behaves the same way or not is unknown (PC v1.01 - he does). The game counts a sin when either Creighton or Pate dies, regardless of player intervention, since apparently the basis for a sin is absorbing the souls of an "innocent" NPC. (Tested on PC version 1.01 while watching the memory location for sin count)(PS3 v1.10, Calibrations 1.15, no sin counted when killing Creighton). The locked room can be found past the door that's "too heavy to open" in the area before the bridge. The wooden chest is booby-trapped but contains Engraved Gauntlets. If the player is hurt by the trap, the voice of the surviving Pate or Creighton can be heard laughing, saying "That'll leave a nasty scar." The loser's armour can be purchased from Merchant Hag Melentia after the fight. In Scholar, if you cleared Shaded Woods before freeing Creighton from the Undead Lockup, he won&apos;t appear in the Shaded Ruins thereafter. I didn&apos;t talk to Crieghtan until after I completed both Huntsmans Copse and Shaded Woods. I went back to HC and unlocked the Undead Lockaway (I totally didn&apos;t see it while I was playing through the area) and exhausted his dialogue. Then I went to the Forked Road bonfire and he isn&apos;t there. Any suggestions? He&apos;s not at Undead Lockaway anymore. Is he really that effective against the 3 skeleton lords?